Eric Husch | Thoughts On "S"
Is the Toronto Review a Secret Message? Longtime “S” fan Adam Laceky has pointed out the following intriguing theory that the Toronto Review article on The Burning Word is actually a secret message from FXC to VMS. This insert originally appears between pp 20-21 in Ship of Theseus. Jennifer Heyward provides the insert for Eric Husch to convince him that The Archer’s Tales is a real book (see marginalia on p21). Note the publication’s title at the bottom of the page: Toronto Review for History and the Humanities, Vol. 1:1 1954. This is the first volume and first issue. Possibly the only issue. And it is published in Toronto. If you note the title page in Ship of Theseus, FXC notes that Winged Shoes Press has two locations – one in New York City and the other in Toronto, Canada. In 1954, FXC would have been five years into her promise to VMS that she would wait ten years for him before she returned “home” to Maraú, Brazil (see symbols and marginalia on p184). Her only means of communicating with him, if he were indeed still alive, would be in the hidden messages of Ship of Theseus published five years earlier and in other public messages that would capture his attention. An article published in a previously nonexistent publication on The Archer’s Tales from a location where FXC is known to have an office would do just that. To lend further credence that the author of the Toronto Review article is FXC, Adam points out that the footnote is in the same style as FXC’s work in Ship of Theseus. So what is the hidden message? FXC (assuming this is her) mentions a variety of dates and locations. Her dates are interesting. The 1759 fire that destroyed San Tadeo, according to the review, could be an allusion to the fire in Stockholm, Sweden, that occurred on July 19, 1759, that injured 19 people and destroyed the spire of the Maria Magdalene Church there. Stockholm also had another major fire in 1625 – on September 1 (9/1). This date is 9/1/1625. In Europe, it might be annotated as 1/9/1625. Now where have we seen that date before? In Ship of Theseus, when S goes missing in the Winter City, Sola comes looking for him. She finally finds him because it was the only place left (p391). On p387, just before S finds Sola on the ninth floor of the building in front of which he now stands, he discovers a plaque buried in ice on the sidewalk. January 9, 1625, is 1/9/1625. But in Europe, as Adam points out, this could represent September 1, 1625. Since the marginalia gives no indication that this plaque was not represented in the original manuscript written by VMS, we can conclude that VMS is the one who created this. This could mean that VMS was trying to tell FXC that, should he ever be missing, that he would reconnect with her in Stockholm, Sweden – mostly likely on September 1 – the anniversary of the 1625 fire. But if she is to meet him in Stockholm on 9/1 of any given year, where is she to meet him. In the 1759 fire, the spire of the Maria Magdalene Church was destroyed. In the Bible, Mary Magdalene was the first person to see Jesus alive – even though she thought he was dead. Perhaps then FXC is to be the first to recognize that VMS is alive when he is otherwise thought to be dead – at this sacred place. Perhaps FXC wrote the Toronto review to say that she recognized VMS’s call for a reunion in Stockholm – and that she would be there in 1954. And what final clue do we have that FXC may have known about the Stockholm connection all along?In the Chapter 10 cipher, all of the locations that FXC left us work out perfectly in the EOTVOS wheel to reveal her message – except one. The letters from the missing column correlate to the sixth footnote (Calais, France) and give us the letters XBTUP. But those letters do not work in the cipher. Only the letters LONOE, which lead us to Maraú, Brazil – FXC’s final destination. But surely XBTUP still means something? Not only does it point to Calais (it all goes back to Calais), but the same letters arise when we punch in the GPS coordinates to Stockholm, Sweden, on the EOTVOS wheel. Was FXC trying to communicate that she understood the Stockholm message from VMS in Chapter 9 (Bird of Negative Space) and the plaque in the Winter City? And, more importantly, is it possible that FXC reconnected with VMS in Stockholm sometime between 1949 and 1959 and the two were able to reunite? Adam Laceky did a fantastic job uncovering these possibilities. And they are definitely worth considering. 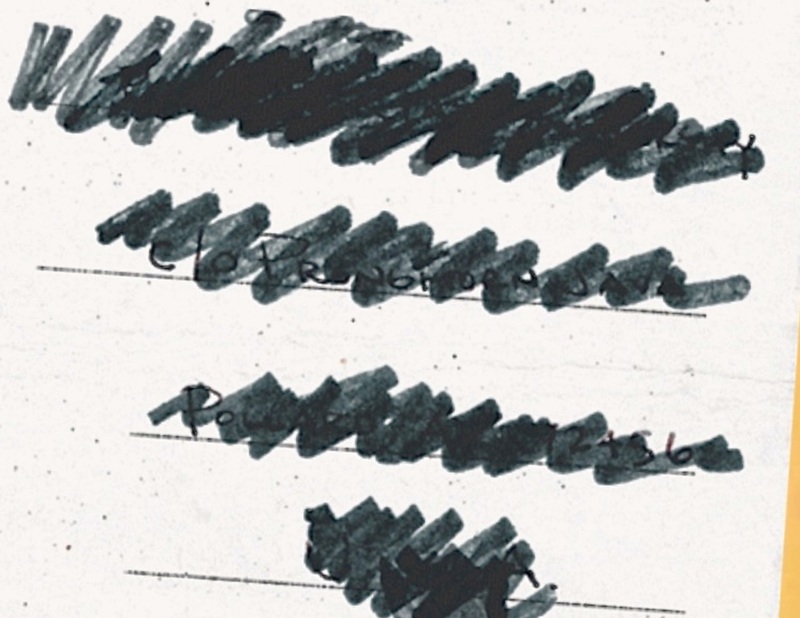 On p2, as Eric and Jen birth their marginalia relationship, Jen believes she has discovered the identity of Eric – Thomas Lyle Chadwick, PSU ID#3946608. By p5, however, Jen has investigated Chadwick further and discovered he is an undergrad in geology, which doesn’t line up with Eric’s story. Jen confronts Eric over this, and once Eric admits he allowed Jen to believe he was Chadwick, Jen gets upset and tells Eric to go to p10 for her response to this atrocity. And it is there that we find Jen’s response – a carefully drawn square with the thick borders in the upper left-hand corner. Eric struggles to understand her response, and we readers, like Eric, are left without a definitive answer. What you will find here is also not a definitive answer, but a list of observations about the conversation leading up to and about this square that seem to carry a few common themes: nothing and three. On the page where Jen “discovers” that Eric is Thomas Chadwick (p2), the page is blank. There is no print from the book. Just to the right of that, we are introduced to “S” – a man with no identity. After Jen confronts Eric, she stops writing in the book for awhile. On p5 Eric says, It’s really disappointing to pick up the book and find nothing from you. Jen tell’s Eric about the square on p5 by saying, Dear Mr. Not Chadwick, see p10 for my response. Next to Jen’s square, after Eric first finds it, he writes, That’s your response?? Um, there’s nothing there. When Jen finally does respond to Eric, she asks Aren’t you a student? Eric responds with I was. I got “expunged” in January. To be expunged is to be made nothing – erased completely from existence. V.M. Straka’s third book is entitled The Square. It is first mentioned in Ship of Theseus on p70, where the main character Franzl is described by FXC in Fn1 as a man with no possessions. The last word in the text on p70 is nonetheless. 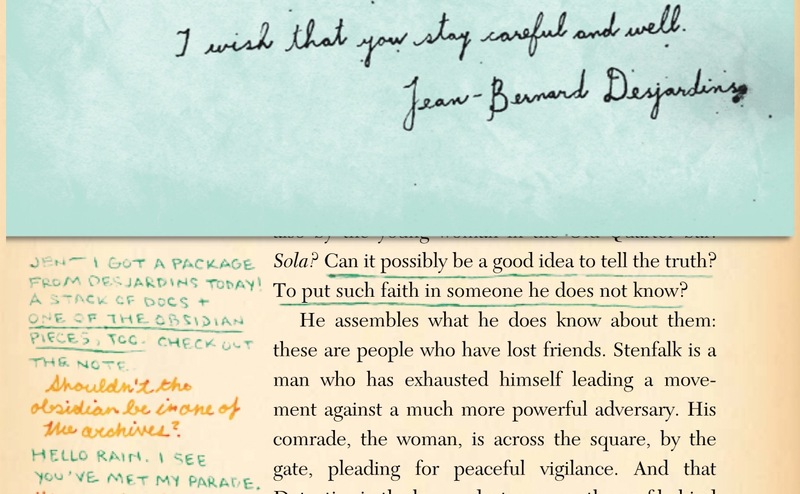 Eric’s pencilled marginalia refers to The Square on p75 and below that, bottom left, Jen says about a code she is trying to track that I’m getting nowhere with this. The Square is the third book in V.M. Straka’s bibliography of nineteen works. On p75, when Eric mentions in pencil that a line has been taken verbatim from The Square, we are first introduced to the Zapadi Three. The only footnote on p75 discusses three possible products manufactured at the factory where Vaclav Straka worked. Eric highlights a section on p88 that these details were drawn from the square (a pun on a drawing of a square?) Within that section a clock strikes three separate hours: twelve, one, and two. The next hour, implied, is of course, three. Again on p88, Pfeifer challenges the police with three men are missing! Probably dead! Why don’t you do your jobs and investigate? These three sentences are italicized in the book. Again on p88, we are reminded that three men are walking along (Pfeifer, Ostrero, and S). Again on p88, Jen underlines three words in a row for emphasis: I don’t need. On p95, Eric notes in pencil that a scene in Ship of Theseus mirrors one in The Square. He also notes three pages from The Square and writes Three different views of the same gesture. Again on p95, Jen underlines three words in a row for emphasis: special collections archive. Again on p95, S spots Sola. S notes she is square-shouldered and while struggling to believe she could possibly be here thinks to himself Concidence be damned. The entire scene that concerns the protest over The Zapadi Three takes place itself in a square (see p86) and closely mimics the central event in Straka’s book The Square over what happened in Haymarket Square in Chicago on May 4, 1886. What do you see when it comes to these, or even other, themes surrounding Jen’s blue square? If you need some ideas, here is another blog post about how truth may be connected to Jen’s blue square. Share your thoughts in the comments below. This is a theory about how we might discover S’s name. If you haven’t already, read this older post called Is S on a Fugue Walkabout? The post below is a sequel to it and reveals more about the song lines discussed there. First, let’s walk through the following references that reveal a consistent juxtaposition of two things: the earth/world and letters/words/sounds/writing. The first words of the book of the Foreword say WHO WAS V.M. STRAKA? The world knows his name. The last page of the book contains the EOTVOS wheel, where different series of letters are associated with geographic coordinates around the world. Page x in the Foreword: I saw the world through the eyes of his characters. Twice in the Foreword on xiii, FXC uses the phrase mundanely literal (Fn11). Mundane means world. Literal means of or belonging to letters or writing. On page xiii of the Foreword: If his remains are in the ground anywhere, they have become part of the earth in its entirety. Translator’s Note and Foreword: Is this a pun? Translate means to relocate – to move from one place to another – like moving around the world. Note could mean a musical note. Foreword could be a pun on forward. Does Translator’s Note and Forward mean, literally, Musical Movement Forward Around the World? The orlop is a key place on S’s ship where mysterious writing takes place when you are part o’ the tradition. Orlop means, literally, overloop. Letters/words/stories being written in the overloop by the crew and eventually S himself as the ship loops its way around the world. S. returns to the world, to the literal space of the secret room on the orlop deck (p297). The cave in the Chapter Down and Out has the story of the K__ people told in images/writing painted onto the earth itself. In the petroglyphs of The Territory – the symbol S was carved into the earth (p350). Anca says that these petroglyphs are our stories. Who we are and why we are here (p344). S is a story written into the earth. In the climax – S kneels down and touches the earth and all the voices in his head go silent. Settled. Voices and narratives, reabsorbed into the ground on which we walk. And this is the key, he realizes, the thing that makes the purpose of all that work on the ship… and in all of the places he’s visited …worthwhile. There was a key in Zepadi’s window box, where earth/ground would have been present to help the flowers grow there (p109). The window above that box had two S-symbols etched into the scrollwork of the shutters (pp130-131). Arquimedes de Sobreiro is a sailor who travelled around the world on a ship – perhaps S’s ship. And his arrows fly around the world and land at his feet (p381). The author of The Archer’s Tales has two references to going around the world – sailing and arrows flying. Archimedes of Syracuse is known for creating the world’s first planetarium. The barrel organ in Chapter 1, where we first meet the monkey, is a device that creates music when the organ grinder (root word ground) rotates it around a central axis. Highlighted portions of the drum translate into notes that play music as the drum is rotated. The climactic story of the people who attend Vevoda’s gala in Chapter 10 revolves around Edvar Vevoda VI: He is the planet at the center of the gala, the axis around which the party whirls and time passes (p410). The Chapter 10 cipher solution uses the EOTVOS wheel and locations around the world to translate letters on the wheel into a message. As “the music plays” in the interlude Tocatta and Fugue in Real Time, S sails around the world poisoning people (p359). It’s as if we are to understand that S’s travels around the world are musical in some way. Cruzatte (the name of the park where Jen wandered away from her parents when she was young) is certainly named after the fiddle player who accompanied Lewis and Clark as they traveled around their world of North America in search of a water route to the Pacific Ocean. The Territory, as S climbs the monkey path up to meet the Governor, is compared to Cruzatte on p351 by Jen. On that path that S travels, he catalogs many sounds, including a monkey and several birds: a Merlin (Stenfalk), a crow (Corbeau), an oystercatcher (Ostrero), and a magpie (S). Birds sing – often as they fly – leaving a different note hanging in the air in different locations as they traverse the earth. V.M. 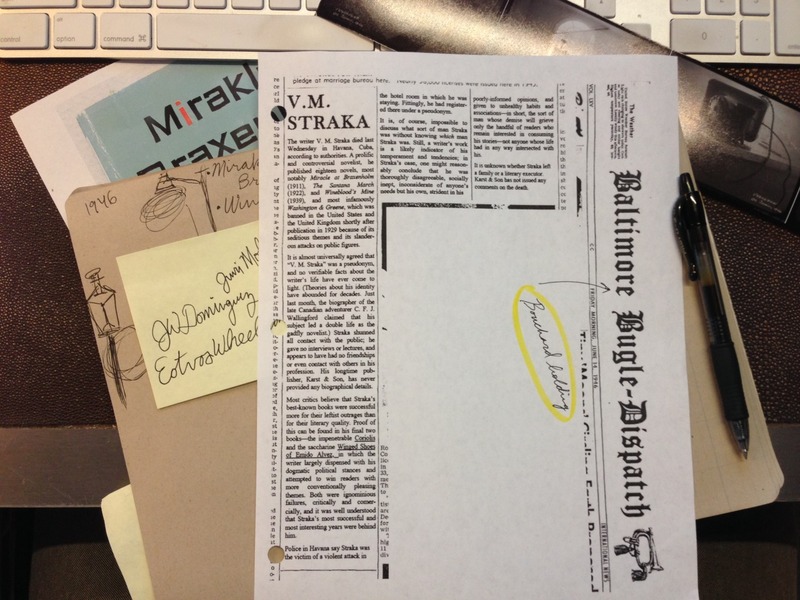 Straka’ S obituary, as it appears in the Baltimore Bugle-Dispatch on June 14, 1946, has an article whose headline has all but been covered up. Careful analysis reveals, however, that it is an early article suggesting that one day the earth could be orbited by hundreds of tiny moons – or satellites. Calais (it all goes back to Calais) is the birthplace of the worldwide wired telegraph – where the first undersea cable connected two countries. From then on, letters/words/messages could be communicated across the earth. Literally, letters travelled around the globe. Bach, in The Art of the Fugue, left an obviously incomplete piece with his own name encoded musically in the final four notes. Written in the margins of this piece is a note by one of Bach’s son claiming that the author died while writing the piece. All of this sounds hauntingly familiar to V.M. Straka’s unfinished tenth chapter of Ship of Theseus, and his untimely death while trying to compete it while we try to determine his name. Did he also encode his name/identity in the name of S? What makes this even more interesting is that the latest theory concerning BACH’s mysterious piece is that he did not die while writing that piece, but instead deliberately presented this piece as an enigma that ultimately points to The Harmony of the Spheres – a philosophical and spiritual belief that the planets create a form of music as they dance around the sun. Doug Dorst once tweeted a clue – it was nothing more than the image of fingers forming a chord on a guitar. That chord turned out to be A-flat diminished, often written as AbDIM. This turns out to be the name Abdim, musically encoded. Abdim is the character in Ship of Theseus that handed S the valise (p244-245). Bach’s name was musically encoded in an unfinished manuscript that he is thought to have died while writing – a remarkable parallel to Straka. And a character in Straka’s novel is also musically encoded in a guitar chord by the meta-author, Doug Dorst. Is Dorst just having a bit of fun with us or is our meta-author giving us a meta-clue? S’s name is encoded musically within Ship of Theseus. The letters/characters of his name are musical notes represented by locations on earth. The musical staff is created by the lines of latitude. 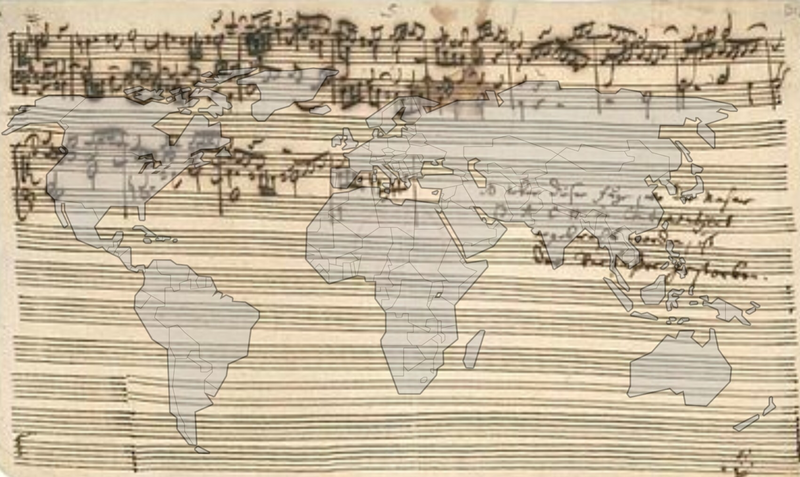 The musical notes are determined by the differences in longitude. The earth, in essence, is like a barrel organ. As it rotates, different points on the earth indicate the sound to be played in order to hear the music. The earth becomes a musical instrument revealing and promoting harmony on our own sphere. The locations themselves are the yet undiscovered locations of B__, G__, El H__, P__ (Prague), The Territory, and perhaps other known/unknown locations, that S navigates on his journey. The first location is Calais, France. Because It all goes back to Calais. If we listen closely, perhaps we can hear the music and discover the song line that reveals the name of S and the identity of both he and V. M. Straka. Between pages 20-21 there is an insert provided by Jennifer Heyward to Eric Husch that proves, for the first time known to anyone in modern history, that The Archer’s Tales was a book that actually existed. Until then, as Eric stated, no evidence existed to suggest that The Archer’s Tales, or Sobreiro, were anything other than figments of V. M. Straka’s imagination. The Archer’s Tales (Los Cuentos del Arquero) was known interchangeably as The Book of S (El Libro de S). It was destroyed in a fire at a Spanish abbey known as San Tadeo de la Tejera in 1759. The abbey was located somewhere near Bilbao, Spain on the northern coast. There were 19 monks at the abbey at the time of the fire, and all but one perished. The brother who survived managed to save and transport a sack of books to the Santiago Cathedral in Bilbao, but he was unable to save The Archer’s Tales. The name San Tadeo de la Tejera means, literally, Saint Heart of the Yew Tree (tadeo = heart, tejera = yew tree). The yew tree has a perfect wood for creating longbows for archery. It is also prized for use in the construction of musical instruments, such as the lute. One of the only two accounts of this story of the abbey, its fire, and the copy of The Archer’s Tales include Captain Norbert Strunk of the whaler ship known as The Imperia. In Ship of Theseus, Sola is traveling on a liner called The Imperia. The other account is from Sister Ulrike Stoecklin of Winterthur, whose name means literally Prosperous and Powerful Tree Stump (Ulrike = prosperity and power, Stoecklin = tree stump). Exactly 100km East of Bilbao, Spain is San Sebastián. Saint Sebastián has numerous references in S.
The volumes most frequently mentioned in the correspondence of visitors to the abbey are two illuminated works: the Lives of the Saints by Emiliano of Zaragoza (early 15th century); and a volume that Father Leopold Jäger referred to as the Albufeira Bible by Eustaquio of Sagres (early 16th century). Both are hailed as astonishing works of artistic vision and meticiulous craft. A compilation of the library’s extensive collection of psalters appears in Appendix F, breviaries in Appending G, and hymnals in Appendix H.
—1. History owns a tremendous debt of gratitude to the unidentifiable young novice who survived the blaze and walked barefoot all the way to Santiago Cathedral in Bilbao whilst toting a sack full of books he had saved from the flames. At the cathedral, he spoke with a priest, Father Ulises, who had been at work scrubbing the stone floors. All we know of the novice comes from Father Ulise’s account: the young man lamented the loss of the other eighteen brothers, but he was utterly inconsolable at having failed to preserve a particular tome, an extensive compendium of fantastic, revelatory, subversive, bawdy, and chilling tales gathered by a mythic archer in his travels across the world. (The title of the book is unclear – Father Ulise’s refers to it once as El Libro de S (“The Book of S”) and once as Los Cuentos deal Arquero (“Tales of the Archer”). As a forbidden secular text, it would not have appeared in the abbey’s written records.) The novice left the sack of books in Father Ulise’s care, accepted water and a half-loaf of bread, and continued on with his travels, of which nothing is known. It is worth noting that we have only third-hand accounts of this exchange between the two religious men, but those sources – Sister Ulrike Stoecklin of Winterthur and Capt. Norbert Strunk of the American whaler Imperia – are not, on the whole, considered unreliable. 2. Igorko’s statement was prescient, in a way. My study of official records in the area and my informal interviews of local residents suggest that hardly anyone believes the abbey ever existed. Why Do We Have Eric and Jen’s Book – Ship of Theseus? These are the final known words written by Jennifer Heyward and Eric Husch in their copy of Ship of Theseus by V.M. Straka. This begs the question why do we have their copy? NO WAY I’M EVER LETTING GO OF THIS BOOK. Eric pronounces these words seriously to Jen in the margins of p76. But if we are to play the role of the reader who stumbles onto their copy of the book and its precious contents, how is it that Eric ever did actually let it go? Someone pointed out to me once that the last words of the marginalia are crossed out, and that might be an ominous sign. After Eric writes OK, someone crosses that word out. Are Eric & Jen not OK any more? HELLO RAIN. I SEE YOU’VE MET MY PARADE. I could put one dot on any page of this book and you’d notice it. Rain is mentioned in both locations. Perhaps it is simply atmospheric. Perhaps there is a different reason Jen placed the red dot on p319 and mentioned it on p86 to see if Eric could find it. Or perhaps we are being subtly drawn to the idea of water falling. WCW’s Rain focuses on water falling and compares it to falling in love. Compare this to the final known written words of Filomela Caldeira in her note to Eric and Jen (see the insert between pp416-417). They are falling, they are falling, they are falling…. The way out was down. Is down. So you’ve finished reading “S.” (If you haven’t, try the Beginner’s Guide to Reading “S” first). Ye’ve got questions. ‘m I right? Why Was the Ending so… Anticlimactic? If you view a single pass of reading through “S” as finishing the book, you might think the “ending” is not all that great. But if you view “S” as something other than a chronologically organized, linear book – one that requires further investigation – rewards await. For example, remember that in the foreword of the book, F. X. Caldeira claims that she was not able to recover all of the pages of Chapter 10 of Ship of Theseus before V. M. Straka either died from a fall through the hotel window or vanished in some sort of staged death. 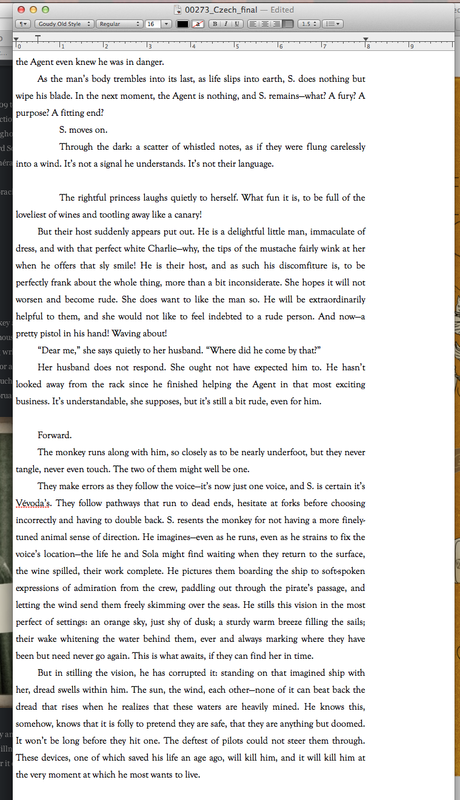 She admits to finishing Chapter 10 the way she thought VMS would have – to the best of her abilities. Did you know that the real ending – the one that VMS wrote himself – has turned up? 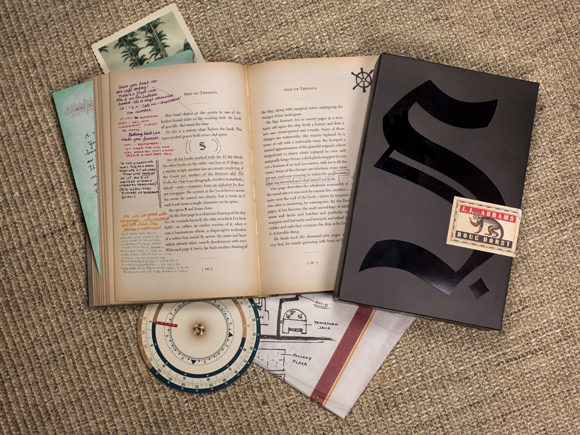 In July of 2014, author Doug Dorst tweeted that the original ending may have been found. Here is that original ending. It stands up well to comments in the marginalia about the real ending that Eric received from FXC in the mail from Arturo (p421-422,430,452). It also seems the most plausible of the other alternative endings. And even when you read both endings, you get the sense that there is much, much more to the story that requires going deeper to uncover it. How Do I Tell What Order Jen & Eric Wrote in the Margins? Pencil. Eric wrote in pencil while taking notes during his early reading(s) of Ship of Theseus before he met Jen. Blue (Jen) and black (Eric). This is the first pass of notes between Eric and Jen after they “meet” in the margins. Green (Eric) and orange (Jen). This is the second pass of comments between Eric and Jen after their relationship has deepened. Purple (Jen) and red (Eric). This is the third set of comments between the two, after they have met in person. Black (both Jen and Eric). These are the final set of notes and include their comments after they move to Prague. Knowing the colors will help you see not only how Eric and Jen’s understanding of Ship of Theseus changes over time, but how their character arcs evolve. Am I the Only One Who Doesn’t Understand What’s Going On? He really was there, right? When the projector went out? I SWEAR I HIT HIM. SIX OR SEVEN TIMES AT LEAST. YOU HEARD ME HIT HIM. So where did he go? MAYBE SERIN HAD PEOPLE THERE, TOO. Wish they’d told us. Also wish we could’ve stayed and watched the stars some more. IT WAS YOUR IDEA TO LEAVE EVERYTHING AND GO. How many parking tickets do you think my car has by now? Both Eric and Jen are there (Jen could hear Eric hitting someone). It took place on the campus of Pollard State University (the victim likely fled in the steam tunnels). There was a projector involved, and when the projector went out, no one could see (Jen could only hear Eric hitting someone). There were stars (Jen wanted to stay and watch them). Eric used to work at PSU’s planetarium, and learned how to use the equipment – which likely includes the projector (p209). The projector went out unexpectedly, and then someone showed up and did something in the dark that caused Eric to hit him. It is likely that this person deliberately turned off the projector and charged Eric in the dark, hoping for a surprise attack. 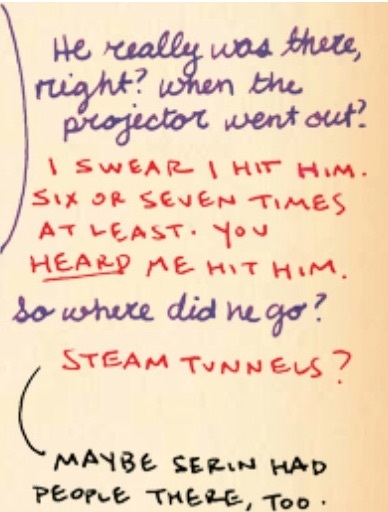 The assailant might have fled using the steam tunnels, which had an access point just outside the west side of the planetarium (see p410 and the napkin map of the steam tunnels, originally included between pages 306-307). On p328, FXC inserts a question not contained in the original manuscript of Ship of Theseus – “WHO IS SIGNE RABE?” On p361, we discover that Signe Rabe was a real person, born 11/4/1930 and later married to Jean Bernard Desjardins on 12/1/1952. The publication date of Ship of Theseus is October, 1949 (title page), and FXC’s foreword was not written until Sunday, October 30, 1949. This means the book must have published on October 31, 1949. The date of FXC’s foreword is significant – it is an anniversary. Can you tell what it is? And just four days after the book was published, something significant happened. Can you tell what, using only the clues mentioned in this bullet point? On p354, as S climbs through the dense band of forest along the hillside up to the governor’s mansion in the territory, he catalogs the sound of several birds that he hears that “sound out of place to him.” They include, in order: a merlin, a crow, an oystercatcher, and a magpie tanager.” There is something very significant about these four birds. Can you see what it is before you read further? 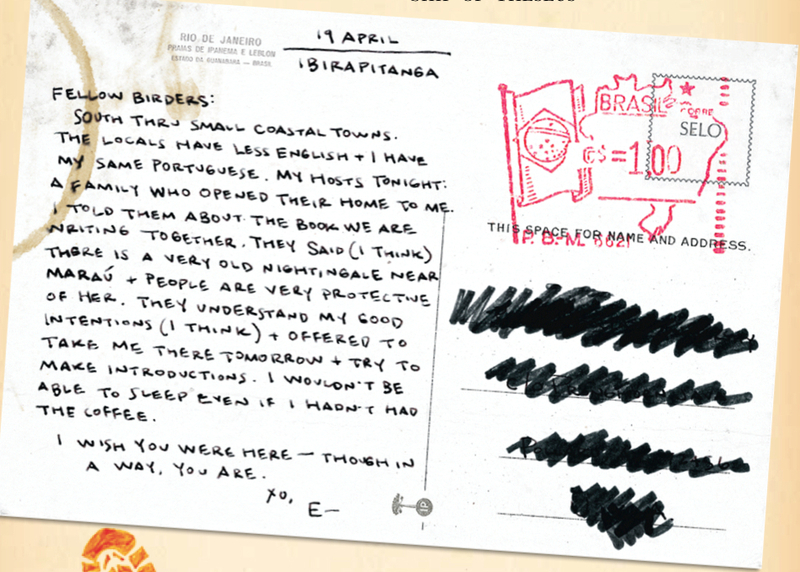 If you look very closely at the postcard inserts (the ones that Eric sent to Jen on his trip to find FXC in Brazil), particularly the one that was inserted between pages 192-193, you can see that the address has been overwritten with a heavy, black marker. However, if you look closely, you can barely make out the actual location of Pronghorn State University. Look at it yourself. Then, go research that area and see if there is anything significant that might help understand “S” better. If you don’t have the patience, see for yourself here. Besides the name S__, several locations in Ship of Theseus are also left either unnamed (the city in which the book opens) or with only the first letter(s) provided: B__, G__, El H__, P__. P__ is mentioned on p321. It doesn’t take much research on Wikipedia to discover what the name of that city is. The others, though, are more of a mystery. And yet we seem to be challenged to discover them. For example, B__ and G__ are close to each other and both lie on the eastern coast of some country/island. We know this because, if you read the details in Agent X (Chapter 4), you will see that S, Stenfalk, Corbeau, Ostrero, and Pfeifer head south from B__ (obviously a coastal town since S washed up in it) to the small port town of G__, which is over the mountains. We know that the coastline is to their right as they look North because of p151-152. At the end of the next chapter, after S leaps into the sea from the cave with Corbeau, he descends into the water so deeply that he startles a school of black scabbardfish. These fish exist only in the Atlantic Ocean between the latitudes of 69° N and 27° N. These details narrow down the location of B__ enough to where, with enough detective work, we might be able to figure out the name of the city – and that may be a clue in and of itself to help solve the rest of the mystery. What about the EOTVOS Wheel? As you have noticed, there are ciphers encoded into Ship of Theseus by FXC with clues in the footnotes. Many of those ciphers are solved by Eric and Jen. Included in the very back of the book Ship of Theseus there is a code wheel that contains various letters (of which you can only see five at a time) and a wheel that lets you change which letters you see by choosing different geographical coordinates in latitude and longitude. Chapter 10 has no cipher solution as presented by Eric and Jen, but they mention that there must be one. If you pay careful attention to the footnotes, you will notice that each one contains a location on the earth that can easily have its geographical coordinates located. Given this, is it possible that the EOTVOS wheel could be used in conjunction with those coordinates in order to obtain a hidden message to VMS from FXC? Give it a try. When you are done, you can check your work here. I encourage you to seek your own connections using the marginalia fragments, scattered facts within Ship of Theseus, and doing your own research and post about them on your own blog or in the comments below so that we can all work together and put the story together better. Here are a few ideas of things to ponder or resources to examine. On p403, Ship of Theseus mentions a woman drowned in wine and washing ashore in Cap de Bol. In the margins, Jen says this actually happened. A newspaper in Marseilles reported it happening on 3/19/1948. But if VMS wrote this long before his supposed death on June 6, 1946, how did he write about something that did not happen until two years later? There has been no known solution to the Interlude or Chapter 9 (Birds of Negative Space) ciphers, if there are any. The EOTVOS Wheel website is officially part of the story and contains more information about the various Straka candidates and Santorini man murders that may help you understand more. The McKay Magazine’s review of Ship of Theseus by Edsel B. Grimshaw, also official, is the review mentioned by Eric in the margins on p18 and p106. The Summersby Confession (also official) in audio format (transcription included) is the tape that Ilsa stole for Moody that helped him advance his book promoting the idea that VMS was Victor Martin Summersby. On p328, Jen repeats her conviction that there is some sort of code present in the “wall-writing” – the words that S cuts into the wood of his room on the xebec and the words he actually intended to write. No one has yet presented a solution. Now that you know roughly in what order Jen and Eric communicated with each other (the different color inks), you can reread their story somewhat chronologically and likely understand things better. What does the valise signify? And why is time so often mentioned in conjunction with it? What does follow the monkey mean? Please feel free to include your own suggestions/questions about what to do next in the comments below. Or, even better, post some answers if you think you have some. And, as if we didn’t have enough rabbit holes to chase, Caroline Furness Jayne wrote the best-known book on string figures, String Figures and How to Make Them: a study of cat’s cradle in many lands, 1906. Interesting how one simple name choice for use in “S” takes us back to handwritten words between two people who love each other. More Clues – Can You Read This? In the Jen Heyward Tumblr Blog, which is proven to be part of the canon of the “S” story, we have discovered several clues. Here is another that needs more work. 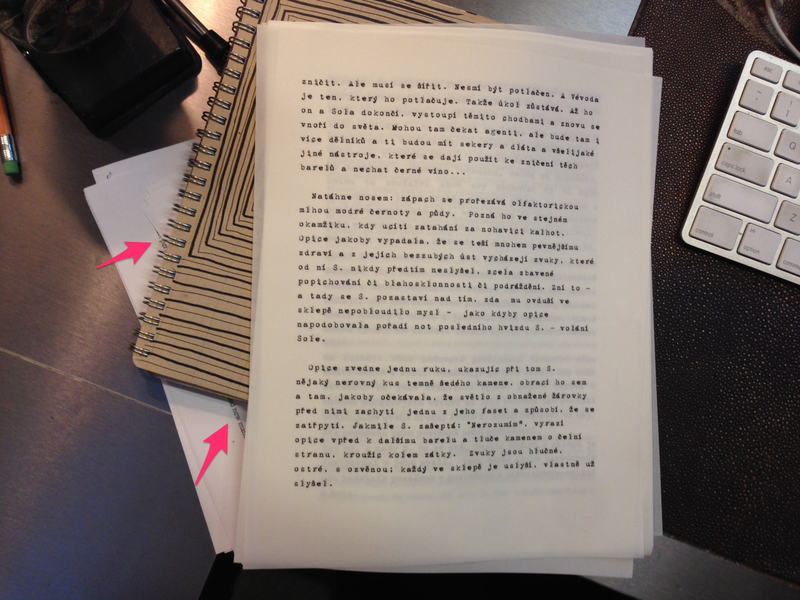 Perhaps you can find the source of the tantalizing text teasing us from beneath the spiral notebook in the photo below (the arrows are added to highlight the text). Here are enlargements of the two sections. If you figure out the words and, more importantly, the source from which they come, let me know by email or in the comments and I’ll add your discovery and credit you. Good luck! On the Jen Heward Tumblr blog, we find a copy in the canon of “S” referred to in Fn1, p259 used to solve the Chapter 7 cipher (see Fn5 and Jen’s marginalia on p263). Here is a helpful transcript (thanks @CFish6) if you would like to read the obituary. The obituary is clearly a copy from the original newspaper. The column is oriented at 90-degrees from the newspaper’s title and the obituary likely was not on the front page. Something that was on the front page has been cut from view. 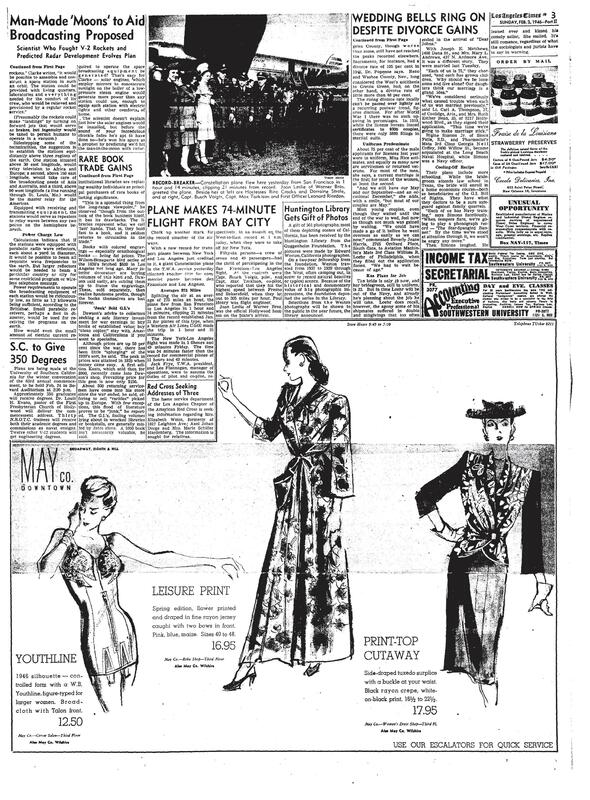 However, if you look closely, you can discern the title of the lead story in the paper. 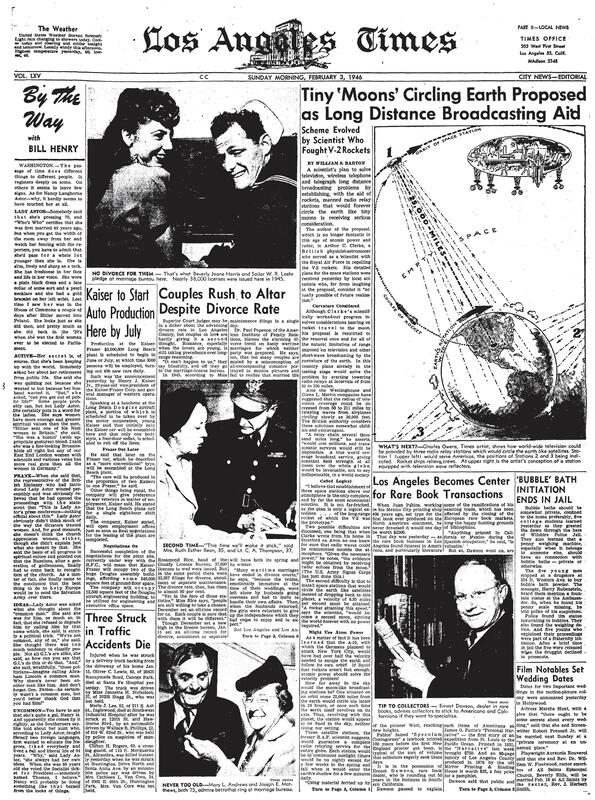 The topic of this article is, in essence, the birth of the idea of launching satellites into space to allow the interrupted international broadcast of television, telephone, and telegraph communications. This article uncovered its ideas from another article, written a few months earlier by none other than Arthur C. Clarke for the magazine Wireless World. Here is the zip code 72456 on Google Maps. @anabrams fan just pointed out the following: Just a few minutes away is Piggot, AR. Highpoints include the Hemingway-Pfeiffer Museum & Education Center. It includes a barn studio and the home of Hemingway and his second wife, Pauline Pfeiffer. Here is an interesting timeline. In this barn studio, Hemingway wrote portions of A Farewell to Arms. If I were Jen and Eric, and I wanted to utilize a book cipher like the one FXC uses on p184, this is the book I would use. The fact that the postcards were sent “C/O Pronghorn Java” means that Vanessa, who worked there, was the recipient and guardian of the postcards – which corresponds to the marginalia at the bottom of p231. And since we know that FXC received an unwelcome visit from someone after Eric (based on Arturo’s letter), then we can infer that Vanessa was not trustworthy. She likely disclosed the postcard information to Moody and/or Ilsa, along with the fact that Eric and Jen would meet there in the private room in the back. If you haven’t already seen the Jen Heyward tumblr blog, take a look. Take a close look. There are more clues there than just the original ending to Chapter 10. My friend Mike, aka @anabramsfan, pointed out to me that in Jen’s screenshot of the VMS ending to Ship of Theseus, there was a window opened behind that one and you could see some text and what looked like a photograph. He also pointed out you could see the cover of The Winged Shoes of Emydio Alves. You can only see thin slivers of these things, but he was right – something was definitely there. Here is the first screenshot. Notice on the right that you can see a large vertical slice of the cover of The Winged Shows of Emydio Alves. The slice on the left is very thin, and you can only see a few letters. Not much to give you a clue as to what you are looking at. In the third screenshot, however, the top window shifts, reducing the amount we see of Winged Shoes and giving as a much larger slice of the left side of the window underneath. Study it carefully. There is text – white letters on a dark background – for the top 2/3 of our slice. Then there is what Mike pointed out looks like some sort of photograph. Then below the photograph, a little more text. Now take a look at this screenshot, taken from the website EOTVOSWHEEL.com. Compare it to the vertical slice in the screenshot above. 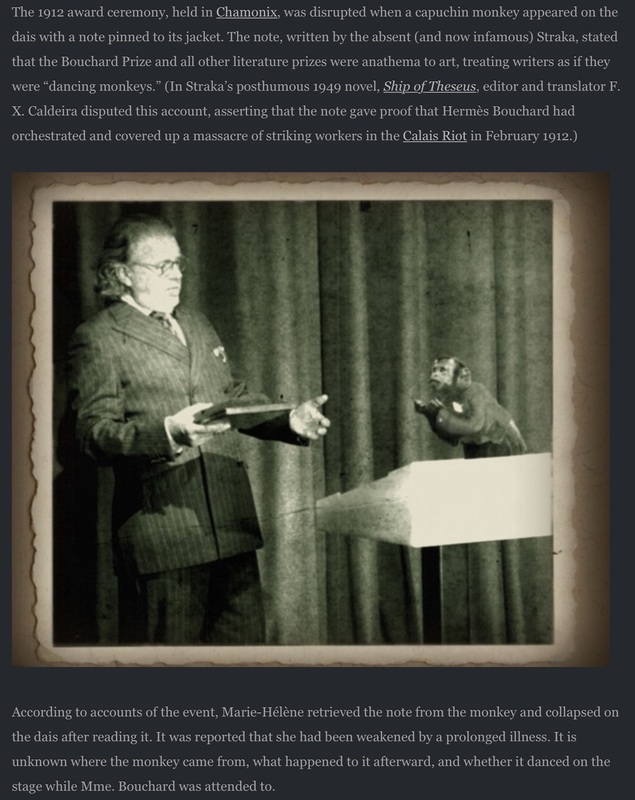 You will see that in the jenheyward tumblr blog screenshot, the visible portion of the photograph includes the lower back of the monkey and the podium on which he sits. You can also see the beginning of the word illness below the photograph, which corresponds to the EOTVOSWHEEL.com site as well. So what we see is that Jen Heyward has a window open on her computer to EOTVOSWHEEL.COM as she is creating the screenshots to reveal the VMS ending to Ship of Theseus. Ah, but is she just looking at the website or is there something more? Take a look at the first screenshot again. Zoom in to the top right corner, which shows a portion of the toolbar above the cover of Winged Shoes. You will see an icon for MAC software that typically means, if I am not mistaken, edit or format. It does not appear that Jen Heyward is viewing the EOTVOSWHEEL.com website. It appears that she is creating it – or at least editing it. Did Jen and Eric make up the name J.W. Dominguez as an alias in order to post theories about V.M. Straka without having their own identities compromised? Does J.W. stand for Jen Heyward? As Mike pointed out, the home page has a post that was erased [REDACTED] due to “cease and desist” orders. Mike suggests maybe Moody/Ilsa are the reason for this. Notice that Jen has, in the background of her photograph on the top right, a contact sheet of the four Havana photographs. They don’t just have single, printed copies from the website. They have either the original, or a copy, of the actual contact sheet from the negatives. But as we have seen, the Havana photographs are fake. Does this mean that Eric/Jen faked them and posted them on EOTVOSWHEEL.COM? Also, on the left-hand side of the obituary is handwriting. You can see the name J.W. Dominguez and Eotvoswheel.com. Above both of those you can also see “Juri Mol” – a name which is cut off before we see the remainder. Is this Juri Moller, whose Pinterest page appears to be the Danish guy posting pictures of the S symbol as he finds them throughout the world – referred to in the marginalia of S? And, newly discovered, if you take a look at the mostly-obscured front-page headline, there is a fascinating article hiding there. Intriguing possibilities. What do you think? So the clock you’re racing – it has to do with Moody? While this Canadian adventurer is fictional to us and real to the world of Eric and Jen, there is a a famous historical person in our world named Richard of Wallingford. He is well-known for his contributions to mathematics and astronomy, but he is most famous for his design of an astronomical clock sometime prior to the year 1327. 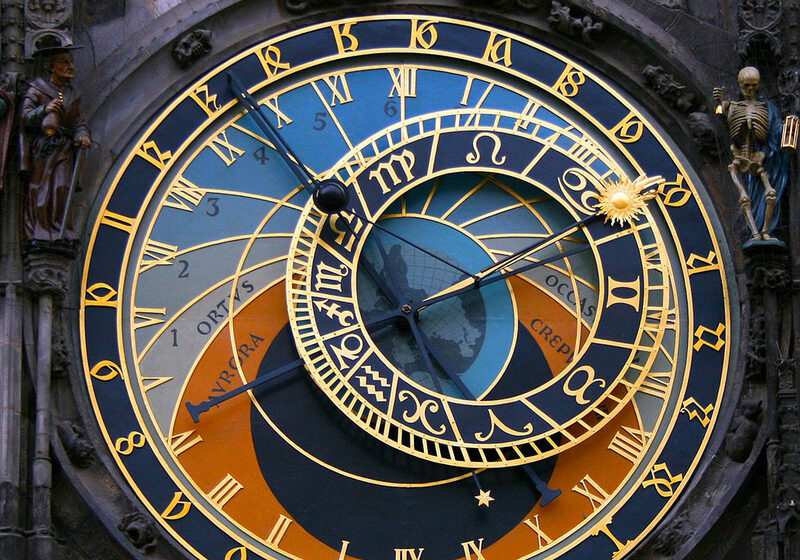 Eric and Jen currently reside in the city of Prague, Czechoslavakia, which is famous for its own ancient and still working astronomical clock (photo above). It is over 600 years old. This seems to be an intentional theme: astronomical clocks and/or clocks and timekeeping in general. Let’s look at a few other textual clues that support this. Please feel free to comment about your own findings. Archimedes invented the first planetarium. He also wrote extensively on the nature of time. This may be the reason for the name of our fictitious friend Arquimedes de Sobreiro. Robert Hooke also helped design the Greenwich Observatory in England, which served as the primary source for accurate timekeeping for centuries. Martial Bourdin was an anarchist who tried to bomb the observatory, but accidentally killed himself. That act helped spawn the idea for Joseph Conrad’s novel The Secret Agent where we find reflection on the measurement of time. He is also mentioned in TS Eliot’s poem Animula. Also, in the S book-hunt-and-giveaway (known as S.earch – December 16-20, 2014), the first book was hidden at The Exley – a bar in Brooklyn. The bar is named after author Frederick Exley, who died before completing his spy novel titled Mean Greenwich Time. His ashes were scattered in Watertown, New York. 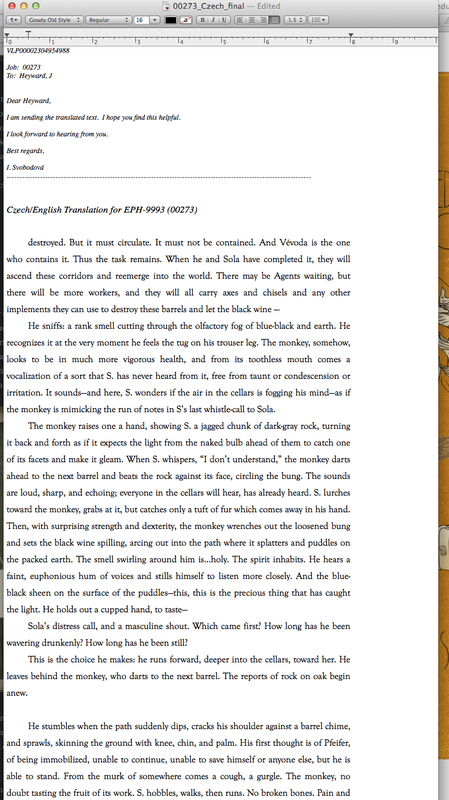 The English version of Ship of Theseus has 456 pages – exactly 19 * 24. Nineteen is our favorite mysterious number in S, and 24 may represent the 24 hours of the day. Is Ship of Theseus a clock of some kind? The Greenwich Observatory sits atop the prime meridian – zero degrees longitude. This imaginary line that runs from North Pole to South Pole serves as the basis for determining longitude around the world. Knowing longitude is critical to marine navigation, and until the use of accurate timekeeping devices onboard ships, the more crude methods of astronomical observation and hours of calculations led to many a maritime disaster. The prime meridian was not always the official, world-recognized launching point for longitudinal positioning. There were others – and many of those locations are found in Ship of Theseus. It’s almost as if we are given a tour of locations of the prime meridian without being explicitly told. The Azores: The Madeira Islands – Jen mentions Sobreiro being real – and an incident happening in the Azores (p49). She found this information in the Nautical Museum database of Madeira. This happens to be one of the few places on earth where black scabbard fish are found – the type of fish S encountered after he leapt from the mouth of the cave between B__ and G__. As S leapt from the mouth of the cave with Corbeau, he had a sudden memory of corks flying on a New Year’s Eve (p197). Here we have sobreiro (cork) and time coming together. The tradition of dropping a time ball on New Year’s Eve began with the popularization of the time ball at Greenwich Observatory. A time ball communicated time visually over a distance. Paris (this prime meridian is sometimes called The Rose Line – for you fans of The DaVinci Code). On p361, we discover that Jean Bernard Desjardins and Signe Rabe were married in Carcassonne, France, on December 1, 1952. The Paris Meridian, or rose line, passes directly through the Church of St. Vincent in Carcassonne. Is this where they were married? On p422 we meet Tupp’s wife. Her name is Roselin. The xebec, S’s ship (or the ship on which he is being held), is referred to on p28 as an anachronism on the modern seas. The literal meaning of anachronism is an error in computing time. And, as we all know, something strange happens to time while S is on board. He may feel he has been at sea for only a few days and discover when he returns to land that years have passed. S even has a determined conversation with Maelstrom about this phenomena on p211-212. Straka stayed at The Grande Horloge (the great clock) across the street from Deux Martres while Ekstrom was there in 1931 (p x11). There is a tantalizing possibility of double meaning in Eric Husch’s description of how FXC spent her final days according to Arturo’s letter (p414). Note Eric’s last sentence: Listening to music like she’d decided it was time. S’s valise has so many references to time and our perception of it that it gets its own post, but here are some teasers. Osfour shouts “Time, TIME!” just before the valise arrives via Abdim. And when an assassin nearly kills S and kicks the valise away from him. The valise yawns open, spilling its contents, and in that moment, for S at least, time comes nearly to a standstill. The invention and development of the telegraph has many allusions in S. Sending time signals across telegraph, initially by wire and then by radio, was crucial to helping know accurate time. Calais, France, was an instrumental part of this development. You have the difficult and unenviable task of locating yourself. The evolution of clockmaking improved dramatically between 1700 and today because it was driven by a singular purpose: the need to be able to locate yourself at sea, particularly your longitude. Knowing your latitude was fairly easy, but determining your longitude required clear skies, careful astronomical observation, and hours of manual calculations. For the most part, the margin of error in navigation was always large and often led to disaster. The problem of determining longitude was so great that Britain created The Longitudinal Prize with a handsome reward to the person/group who could figure out a way to determine longitude accurately while at sea. Out of this contest was born the rapid improvements in precision clock-making, particularly by John Harrison. Knowing where had as its ultimate solution knowing when you were. Surely this has something to do with our EOTVOS wheel. Perhaps it is as much a clock as it is a GPS-decryption device. Here are a few very interesting things to point out about where Eric Husch found Filomela Fabregas Caldeira. Marau, Brazil, lies at coordinates 14S, 39W – corresponding to EOTVOS wheel letters LONOE. These letters correctly complete the missing letters from the Chapter 10 Cipher, specifically FN6. FN6 indicates we should dial in Calais, France, which produces XBTUP, but that doesn’t work in the cipher solution. It appears FXC was leaving a clue for the possibly-still-living VMS to come find her in Brazil. 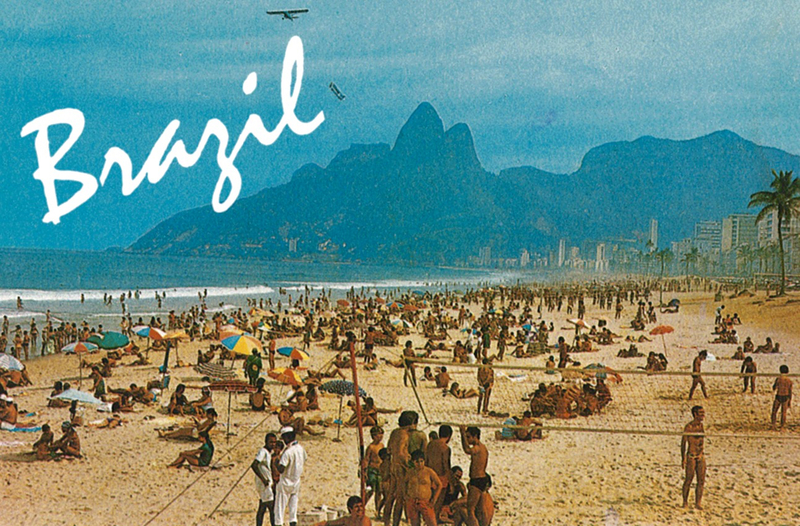 Marau, Brazil is also known as San Sebastian of Marau. Saint Sebastian makes at least two important appearances in “S” and hails from LOST as well. The name San Sebastian of Marau was given by capuchin monks. In Portugal, there is the Convent of the Cork – home to capuchin monks – where the buildings are largely made of sobreiro. This discussion between Eric Husch and Jennifer Heyward on p453 of V.M. Straka Ship of Theseus is a tantalizing puzzle piece. It is the only reference in S to a peculiar event with scant details. Here is what we know about the event. The most logical conclusion is that this event occurred inside PSU’s Mallon Planetarium. The projector is probably the planetarium projector, which projects the stars Jen wanted to stay and watch onto the domed ceiling. Eric used to work at the planetarium and knew how to operate the equipment (p209). The planetarium has direct access to the steam tunnels (p410). Why include mention of such a pivotal event but with so few clues? Why is this event written in the margins of the climax of Ship of Theseus? Are more details about this event out there on the web? Author Doug Dorst has mentioned in several interviews that S-related resources exist on the internet that have not yet been found. Is it important that Archimedes invented the first planetarium and that Archimedes de Sobreiro is an important character in Ship of Theseus? Is it important that Robert Hooke, who first discovered biological cells by looking at cork (sobreiro) under a microscope, postulated the first accurate theory of planetary motion based on gravity? Who exactly was the person that Eric hit and that Jen was surprised was even present? Moody? Someone else? 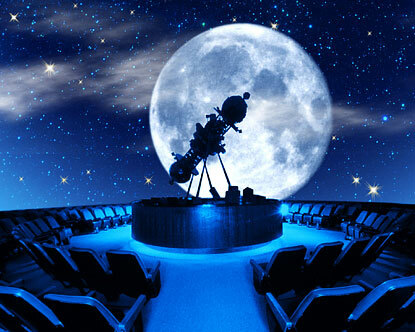 What kind of Straka event would be held in the planetarium? Something related to Chapter 2, The Drifting Twins? Something else? What comments or questions do you have? Is this our Clue for the Code? Welcome to the World of "S."